Today I will be reviewing the Osprey Porter 46 liter backpack built by Osprey. Osprey is a very well-known and reputable company that has been around for over 40 years and makes quality travel gear that is tough to beat. They also offer one of the best guarantees in the business. Osprey is a powerhouse of a travel gear company and one I love to review and get hands on with. We’ll cover the style, the comfortability, the durability and functionality of the Osprey Porter below. As always if you want the condensed version, you can see what’s good and what’s bad, down below. The Osprey Porter is a great looking backpack and one that I’m excited to review. 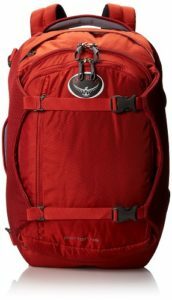 Osprey is probably my favorite brand for travel gear and they make great backpacks for international traveling, including backpacking through Europe. The design of the Osprey Porter is just very sleek and modern looking. I love how everything just flows so smoothly and it looks well built, like it’s designed to be used multiple times in many different conditions. 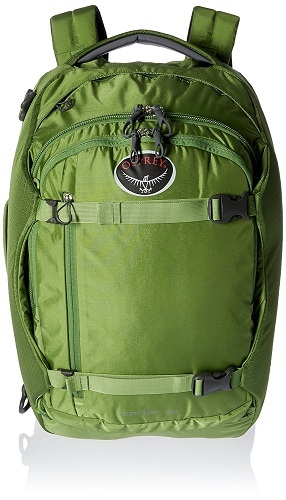 Osprey offers their 46 liter Porter backpack in 3 different colors which include; black, red and green. All three look fantastic, although I’m a fan of black myself. A neat feature that Osprey implements in many of their backpacks is the ability to stow and hide your shoulder and waist straps in the back lining of the Porter backpack. 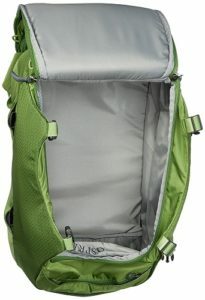 This gives the pack a clean look, almost like a piece of luggage and makes it easy for traveling on planes or trains. When you’re ready to do some walking or hiking, you can simply pull the shoulder and waist straps out and get on your way. The Osprey Porter backpack is a good looking backpack with sleek lines and a modern appeal. With its ability to hide straps when not in use and a couple variations of color to choose from, Osprey has the makings of a great backpack on their hands here. 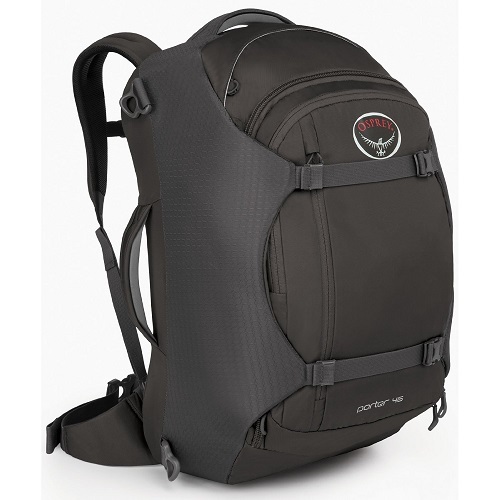 Overall I give the Osprey Porter 46 liter backpack 5 out of 5 stars. 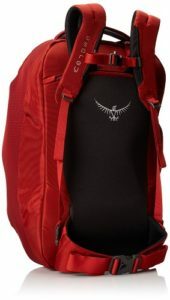 Osprey has some of the best fitting and most comfortable travel backpacks on the market. They make it easy to get out there and go for miles without any discomfort. They have a number of features that make the backpack as comfortable as possible. Seeing as how we were just speaking about the shoulder straps and waist straps, we’ll start with that. The shoulder straps on the Osprey Porter are well padded and also come with an adjustable sternum strap that allows you to tighten or loosen the strap to make it so the pack fits as ergonomically as possible. I personally never use the sternum strap but I tested it out and it works out perfectly. The waist straps are also padded and buckle together which allows the backpack to evenly distribute the weight of the backpack so that it’s not all bearing down on one spot but spread evenly. There are also compression straps on the back of the Osprey Porter. They allow you to, well, compress your contents that are in the backpack which helps stabilize the load when you’re moving about. When I was traveling for three weeks over in Europe, I would see lots of people wearing their daypacks on the front instead of the back to avoid any kind of pickpockets or theft. I do not recommend doing that with this backpack. Those daypacks are usually around 15 to 20 liters and this is 46 liters. It would kill your back trying to support it the whole time. It is best to wear it only on your back. All in all the Osprey Porter 46 liter backpack is about as comfortable as a backpack can be. It has excellent padded shoulder and waist straps. The waist strap is adjustable as well as a sternum strap attached to the shoulder straps which helps distribute weight evenly. And the Osprey Porter also has compression straps that allow you to stabilize your backpack when it’s loaded. For these reasons the Osprey Porter 46 liter backpack gets 5 out of 5 stars. If you’ve never heard of Osprey before then you may not be aware of the type of products they make. And I don’t just mean the category of products; Osprey makes some of the highest quality products in the whole travel gear business. Let’s take a look at what makes the Osprey Porter one of the best travel backpacks available to buy. A lot of people are worried about traveling with backpacks on flights, fearful of baggage handlers and specifically straps getting torn off when the backpack goes through the belts. Thankfully Osprey builds their backpacks with the ability to zip away and hide the shoulder and side straps. This means you can confidently use it as checked baggage if you need to. I’ve personally travelled with numerous Osprey backpacks and have been on numerous flights, both domestically and internationally, and I have never had a problem with my backpacks getting torn up or abused as they are ruggedly built. The materials are pretty thick and durable and the backpack comes with foam padded siding. The backpack isn’t labeled as waterproof but I’ve walked in a quick rain with it without any kind of cover and it shed the rain fine. For longer water/rain exposure I’m not sure it would do the job without any kind of cover though. 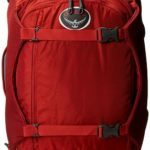 Finally Osprey offers one of the best warranties in the business. Osprey has the “All Mighty Guarantee” which means they will repair any damage or defect for any reason whatsoever free of charge. It doesn’t matter whether you bought the backpack when the company first launched over 40 years ago or today. If they are unable to repair it for any reason they will replace your pack. How’s that for a guarantee?! Osprey offers some of the best durability you can find in travel gear, specifically backpacks. They are well designed and if for any reason you need to have it repaired or replaced, the All Mighty Guarantee has you covered. The Osprey Porter gets all of this backing and for that it gets my full backing of 5 out of 5 stars. Functionality is not a problem when it comes to Osprey backpacks and the Osprey Porter is no exception. It has plenty of functionality, some of which we’ve already mentioned, however, one of its features would be better suited if it had a very slight design change. Let’s see what the Osprey Porter has in store and where it could use some very slight tweaks. To start the Osprey Porter 46 liter backpack has an ingenious design that is used on many of the other backpacks as well. 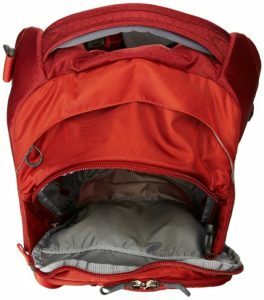 It is a panel loaded backpack which means you can essentially open the backpack up like a suitcase and put your clothes in there. This is super handy when traveling so that you don’t have to pull everything out first and can just pick out what you need whenever you need it. It is by far my favorite aspect of the backpack. There are two divided areas inside the main compartment. There is an internal fabric zippered pocket and an internal mesh zippered pocket which allows you to organize your contents even more. However, the pockets on this backpack are where there is a small concern. A panel pocket that is built for holding tablets or computers is actually on the front side of the bag instead of the back and it’s slightly small. I had to squeeze my 15 inch laptop in there with everything I had but then I also have to worry about running into things as it does not have that protection from being up against the back side of the backpack. A backpack with a laptop sling may be better suited for you if you need to bring your laptop with. A feature I use religiously when traveling, especially overseas, is the lockable zippers. It is such an easy thing to implement with your zippers and I’m glad that Osprey does this; not only on the Porter but on all of their backpacks. If you bought this backpack and didn’t think there was enough room, well then you can do what many other people have done before. You can get an additional Osprey Daylite daypack which is sold separately and use the four reinforced cord loops on the Porter backpacks front panel to strap the Daylite pack on. You could buy a larger backpack but this allows you to do two things. One, you could just use either backpack separately if you only needed that. And two, you could use the backpack as a carry-on and the Daylite pack as a personal bag, so you wouldn’t need to check either. And this brings me to my final feature that is great about the Osprey Porter 46 liter backpack. It is a carry-on backpack. You are able to carry this on pretty much any flight. I have been on JetBlue, RyanAir, EasyJet and many more without issue. The only small gripe I have about this backpack aside from the small panel being on the outside for the laptops and tablets is actually another pocket. Only this one is missing. There are no outside pockets or mesh pockets to store like street maps, water bottles and things of that nature. All in all the Osprey Porter 46 liter backpack is a travel pack worth considering for your next road trip or overseas adventure. It’s perfect for a weekend trip or even a couple weeks. With all of the functionality that it offers it’s tough not to think this is the pack you should go with but those small concerns I mentioned might throw some people off. With all of this considered I will give the Osprey Porter 4 out of 5 stars for functionality. This is the Osprey Porter 46 liter backpack built to take you on an adventure and stand the rigors of traveling. Let’s take a quick look at what Osprey has done well and what they could improve on with the Porter 46 liter. Osprey was smart in the design of the Porter 46 liter backpack in that they knew people would be using the travel gear as a piece of luggage. For this reason they implemented a way to zip up your shoulder straps and waist straps into the backpack so they are not dangling around if you check your backpack at the airport. The Osprey Porter has thick padded shoulder and waist straps along with a sternum strap to allow you to tight the backpack to you for easier carrying. 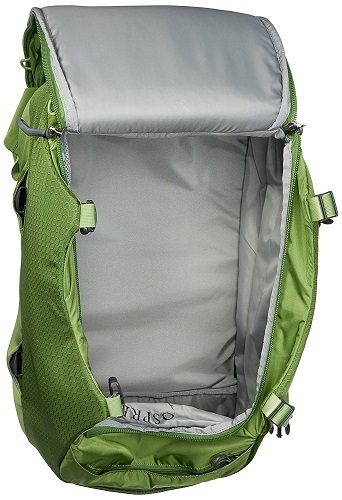 Plus the compression straps allow you to stabilize the backpack even more making it more comfortable to carry. The material that Osprey Porter uses is thick enough to take a beating from traveling as well as shed a light rain. If you are still worried about the quality or craftsman ship of the Osprey Porter then you can always fall back on Osprey’s All Mighty Guarantee which is a lifetime warranty to fix or replace your backpack. The Osprey Porter has tons of space for your next adventure. It can easily hold a week’s worth of clothing and some. It also has a separate designated pocket for tablets/laptops. If you needed more room, you can also attach a separate Osprey Daylite pack to the outside. To top it off the Porter is carry-on friendly with every airline I’ve been on and that’s at least half a dozen. I wouldn’t be worried about this not fitting in the overhead compartment. A few more colors to choose from wouldn’t have hurt but I like the colors that are available. However I’m sure there are some people out there that would like to express themselves a little more with a different colored backpack. There are no mesh/outside pockets on the Osprey Porter. This prevents us from storing simple things like small papers or water bottles and what not. The laptop/tablet sleeve that is built into the Porter 46 liter backpack is just a little small and I have a tough time getting my 15 inch laptop in there. Plus it’s against the front side of the backpack and lacks the protection that it would have, had it been up against the back. This is one hell of a travel backpack and one that I thoroughly enjoy using and reviewing. The price tag is what you would expect to pay for a solid name brand like Osprey and thus it’s a little pricey. You can certainly find similar sized backpacks for cheaper but can also find much more expensive as well. It does a great job all over and by far a top choice to consider for your next adventure. Taking into account some very minor areas that Osprey could improve on I have to give the Osprey Porter 46 liter backpack 4.5 out of 5 stars. Have an Osprey Porter of your own and want to leave a review, you can do so below now!